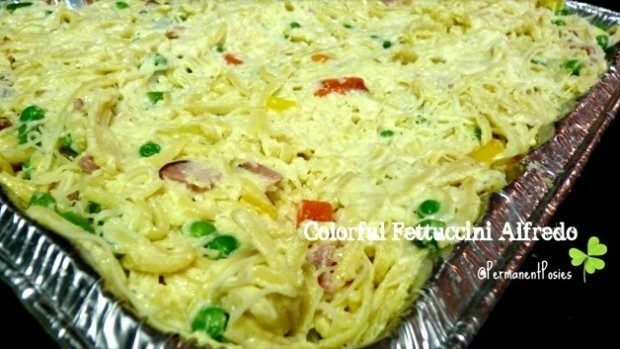 You are here: Home / Recipes / Dinner / Colorful Fettuccini Recipe! I had to take a very large casserole to church for a funeral meal the other day. I don’t know who died but I am on that committee. Really, all the ministries I am involved in have to do with providing food. What a surprise, right? But funerals are special to me. I guess because I have lost so many family members and the food people provided was so comforting. A need met….sometimes by strangers…. I like to do the same. I also like to cook the family involved some kind of comfort food. Did you know that the term comfort food was introduced into the Webster’s Dictionary in 1977 (according to Wikipedia). Comfort food piques positive emotions…..sometimes nostalgia. It also has some effect on mood….hormonally…..providing….like the word says, comfort. Just so happens, macaroni and cheese is on the list of American comfort food (on Wikipedia). So, for funerals, I like to provide some kind of pasta with some kind of cheese……comfort food. This recipe is for a very large casserole…..and feeds a lot of people….not sure how many. But, if you have seen the extra large disposable pans at Costco…..that is the size. For a regular lasagna pan size, you could probably cut this recipe in half. Cook the fettuccini in boiling water. I broke it in half as I was putting it in the pan. Drain and run cold water over until the fettuccini is completely cooled off to stop the cooking process. Chop the ham into very small pieces and saute in 1 tbsp oil until a little browned. Remove from pan. In same pan, saute the onion and bell peppers in 2 tbsp oil. Remove from pan. In same pan, saute the asparagus in 1 tbsp oil until barely tender and remove from pan. In same pan, melt the butter. Add the flour and stir well. Add about 6 cups of the milk and whisk. Let cook until it thickens and slowly add the Half and Half. In the microwave, heat the water for 1 minute and add the bouillon to it. Stir that until the bouillon dissolves and add it into the cream sauce. Blend well. Add the Parmesan Cheese to the cream mixture…..and if it is too thick, add another cup of milk (which mine was). Add the spices to the cream mixture. In the microwave, thaw the peas. Now put the fettuccini and vegetables in the large disposable pan and gently toss it all together. Pour the cream mixture over the fettuccini and gently toss together. Add 1/2 the pound of grated Italian Cheese blend and mix it into the fettuccini. Pour the last cup of milk on top and gently toss it in. Put the other 1/2 of cheese on top of the casserole. Spray foil with Pam to prevent it from sticking to the cheese. Cook covered at 350 degrees for about one and half hours…..or until completely heated through. Uncover and cook another 15 minutes to slightly brown the cheese.